If you’re anything like me you..
Have experiences any of the following unwanted things after downing one of said morning blends..
You’re extremely hungry only 1 hour after because let’s face it, even if the meal looked pretty with all that fruit and sweet toppings, it wasn’t loaded with things that keep you full for very long. After what usually are very frozen smoothie bowls, you felt like your digestive system took a trip to the arctic and totally shut down. Your blood sugar levels went soaring and then, 30 minutes later, crashed at your feet and your hormone system wasn’t very happy about the trip. Does any of these ring a bell? If so, here are some good news: I have found a way to enjoy a really delicious, good looking and good for you creamy smoothie bowl that checks off zero of the things on the list. Instead, it keeps me full until lunch and my digestive system enjoys the lack of freezer chock. Also, it keeps my blood sugar + hormones stabil and happy (and let’s face it, they run the show so keeping those levels sane are everything). We’ve had versions of this Veggie Loaded Smoothie DREAM ever since spring when I no longer felt like bowls of Powerful Porridge Mix. I’ve tweaked the measurements ever since, and while it’s been perfect for months, I haven’t had a moment to shoot and write this between kids, Wildlyh home building and workstuff. But finally! Now! TIME TO REVOLUTIONIZE YO BREAKFAST! 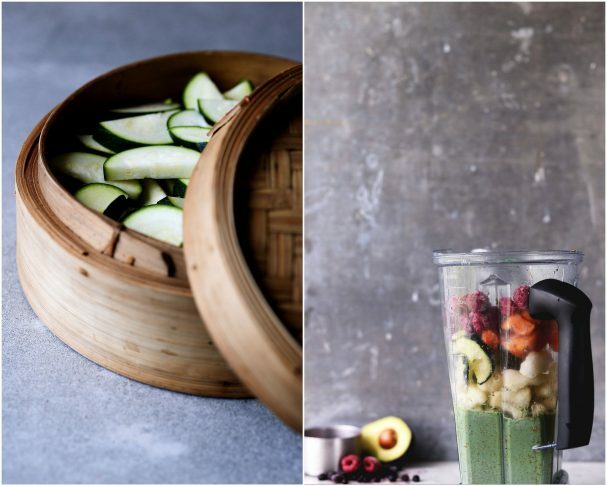 Have you already scrolled through the list of ingredients for this smoothie and feel a bit put off by the list of veggies included? DON’T FRET! Yes, in all-caps. The frozen vegetables are in perfect balance to each other and the other ingredients, which makes the end-result oh-so tasty. 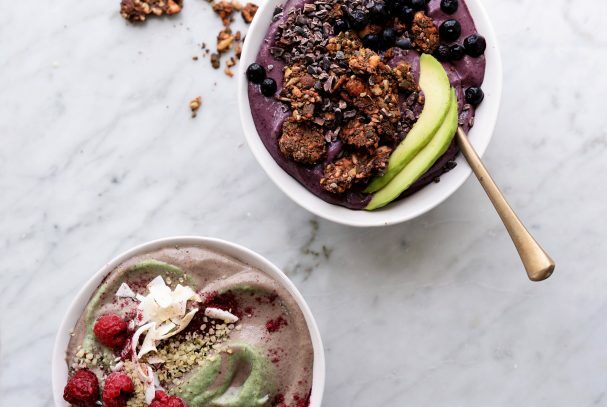 While these bowls does not in any way taste like a smoothie loaded with frozen banana or mango, it has sweet notes of berries, tangy hits of lemon and an overall creamy, deliciousness. To me and my taste-testers it’s perfect and I hope you’ll bring it into your routine as well. 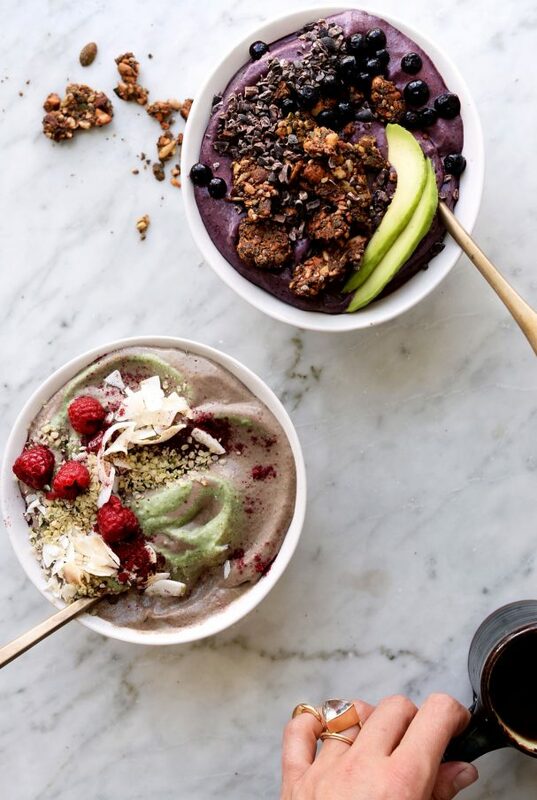 A breakfast packed with fiber, antioxidants and awesome fats from the chia, flax, coconut, frozen vegetables and (optional) superfoods. WHY NO FRUIT? With the long-lasting sense of satisfaction that this breakfast gives, and without the need to look for snacks only an hour after breakfast I notice a difference in the way I approach my days. Because my blood sugar doesn’t rollar coaster away I feel strong and centered which in turn let’s me focus on the things I’m meant to focus on. All the YAY’s! I can’t wait to hear how you’ll feel if you invite this morning (or lunch/snack/dinner) boost! So.. steamed + frozen vegetables in smoothies?! 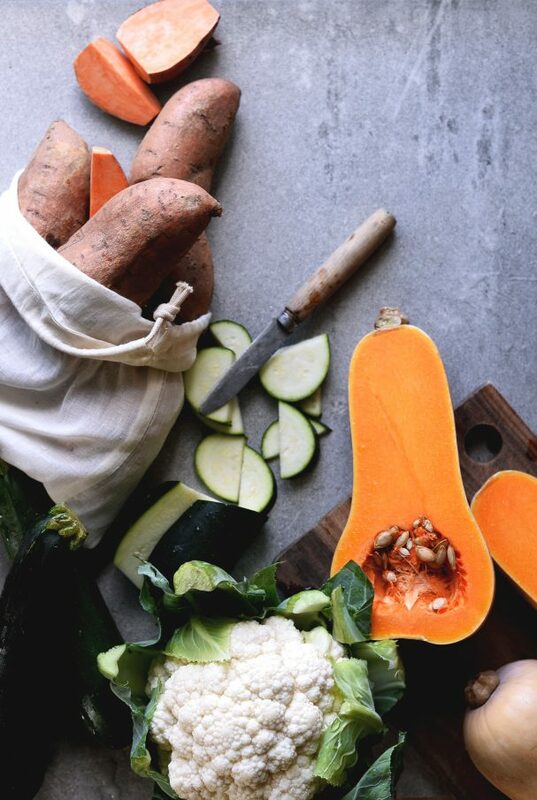 Steaming and freezing vegetables for smoothies have been a routine for a long time in our household and people often wonder why I steam them first. It’s simply because it makes it so much easier on the digestive system and I highly recommend trying it out. If you are all for the raw stuff, go right ahead and skip the steaming. 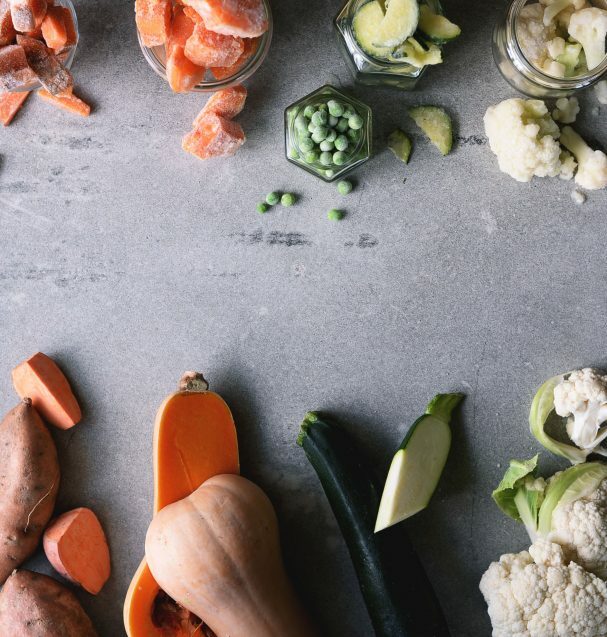 A freezer stocked with steamed + frozen veggies like zucchini, butternut squash, sweet potato, cauliflower and peas makes it easier to throw together tasty blends for the whole family that are loaded with good stuff. If you’re curious about other favorite combinations let me know in the comments below! Noteworthy: my older kiddo (4yrs) only accepts this with some blended in frozen banana/more berries while my 1.5 year old happily gobbles it down. This fruit-free, protein-, fiber- and good fat-loaded breakfast bowl is the bomb! 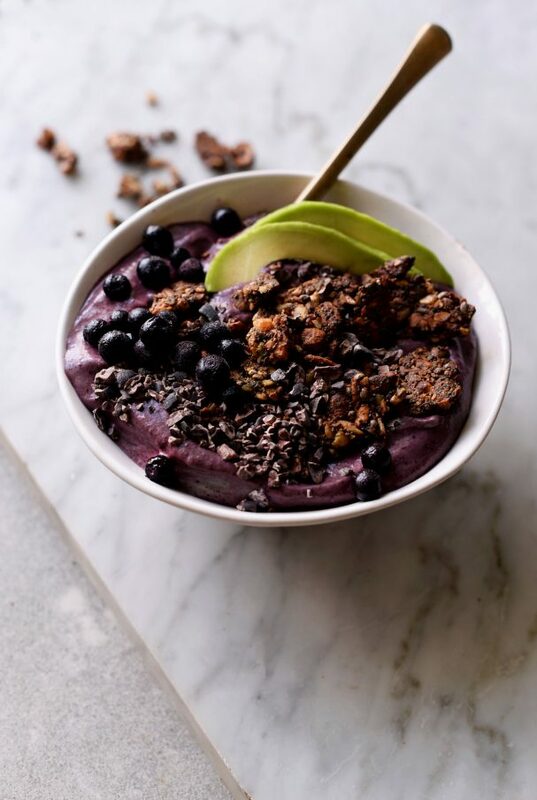 Pair it with your favorite toppings like granola (pictured is my grain-free Granola Gravel), nut butter, berries, cacao nibs and coconut chips in the morning. It will keep your energy-levels happy, you’ll stay full for a long time and you’ll be ready for any adventures. Stock your freezer with frozen vegetables, and tomorrow morning you’ll be ready to blend. Taste & Texture: Creamy with an almost yoghurt-y feel to it. Thick without being frozen. Use plant milk as liquid if you want a ’rounder’ flavor. I usually go for 50/50 milk/water. Add a couple of slices of frozen banana if you are unsure about the amount of vegetables (it IS already sweet though). Prep options: Are you a Sunday batch person? If so, prepare 5 glass jars of: chia, flax, coconut, optional superfoods, vanilla, stevia and the liquid. Shake well to combine and then refrigerate. In the morning, add the content of one jar into the blender and then add the frozen vegetables, berries, avocado, lemon (+ optional greens). Blend. Add-in options: My go-to’s for this are either my Nordic Superfood Mix or spirulina and wheat grass. It’s up to you to add a couple of your favorite adaptogens/ superfoods or not. Maca, Camu Camu, Chlorella, Rosehip, Cordyceps, Chaga, Rhodiola, all of them work! I often also add a big handful of kind-tasting leafy greens like spinach, romaine, matche lettuce or such. This fruit-free blend is NOT a good place for kale which is too harsh-tasting. Preferably soak the flax and chia overnight in the liquid. If you forget, a 5 min morning soak is better than none. Add all ingredients to a high speed blender and blend until super smooth and thick. Pour into your favorite bowl, smooth out the surface with the backside of a spoon and add your favorite toppings. Dig in! Sheesh, thanks for sticking with me through this loaded post! I know many of you have waited for this one and I really wanted to do a full on guide. I hope you like it and find it super useful!